The forest department approached the top court as it has been finding it tough to catch the big cat that has already claimed at least nine lives in the Ralegaon forest area oin Maharashtra. NEW DELHI: Should a 'man-eater' tigress be tranquilized or shot dead? This peculiar question has come in the way of the forest department which has been finding it tough to catch the big cat that has already claimed at least nine lives in the Ralegaon forest area of Yavatmal district in Maharashtra. 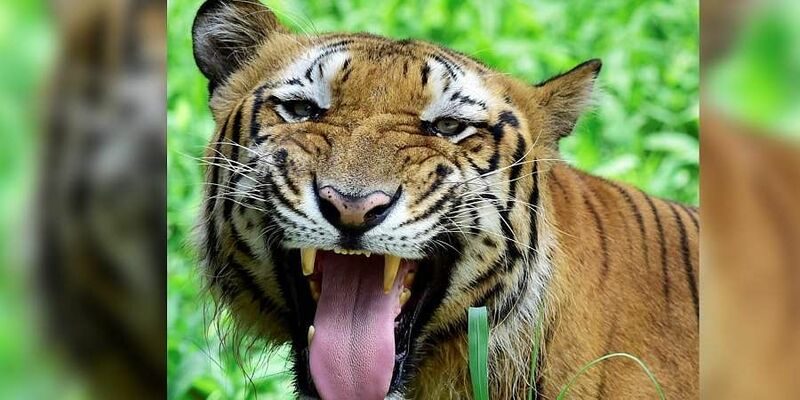 The forest department has claimed that the six-year-old tigress, identified as T1, along with two of her nine-month-old cubs, have consumed 60 per cent of a human corpse, that has led it to declare her a 'man-eater'. The question whether the tigress, which claimed three lives last month, should be tranquilized or shot and killed reached before the Supreme Court Tuesday. The apex court heard the petitions challenging the Bombay Hight Court's recent decision giving a go-ahead to the forest department to implement its order to tranquilize or shoot the tigress. While the petitioners claimed that it has not been established that the corpse was eaten by the tigress and her cubs, the forest department maintained that the big cat was responsible for at least nine deaths. The department said they were trying hard to get to a 'touching distance' of the tigress to dart her with a tranquilizer for the last six months, but have failed. The petitioners urged a bench of Justices Madan B Lokur and Deepak Gupta that if the tigress was shot dead, both her cubs would not be able to survive in the forest. The bench, while refusing to interfere with the high court decision, said the forest department would be bound by their own order to tranquilize her first and, in case of failure, shoot her. When the counsel for one of the petitioners said the forest department has roped in a "sharp shooter" to straightaway kill the tigress, the bench said "We have said that they (forest department) will be bound by their order". Senior advocate Anand Grover, appearing for another petitioner, told the court that even if people entering the forest area get killed by the tigress, that does not make her a 'man eater'. "A distinction has to be made between a tigress killing a human and a habitual man eater," he said. "Does the post-mortem report indicate it (that these persons were killed by the tigress)," the bench asked. Responding to the query, the counsel representing the forest department said the post-mortem report talks of a puncture wound on the neck of the victim and the tigress and her two cubs are responsible for the kill. "There is no other tiger there, except this tigress and her two cubs. The closest tiger, T2, which is a male, is seven kilometres away from the spot of the incident," the lawyer said, adding there are seven tigers in the entire forest. He also claimed that this tigress has killed nine humans and the villagers have seen her along with the cubs near the spot where the incident took place. "There are puncture wounds on the neck (of one of the victims). Bite marks are also there. Pugmarks are also there," he said, adding that from September 22 last year till January end this year, six persons have been killed by the tigress. He said that attempts to tranquilize her in the past six months have failed due to various reasons, including the terrain inside the forest area. "The two cubs may also become man-eaters, if action is not taken," he said. Grover, however, said the tigress cannot be held responsible if people entered the forest and are killed by animals. He said that DNA profiling, which could have established whether the tigress had killed these persons and also eaten them, has not even been done. In February, the high court had stayed the shoot order against the tigress after it was found that she was moving along with her two newly-born cubs.